We have a tendency to look at retrogrades as a bad thing. Really, they are the epitome of a second chance – revising and redoing, offering perspective in the interest of progress. They are a moment to unleash love, hash out hurts, affirm actions, and swirl spinning thoughts into inquiries. As Mercury and Saturn slow their pace to turn retrograde this week, the Three of Cups appears again to remind us there is no right way to love. The question What if? is like a cradle we get to crawl into – where we will be held, where judgement falls away, where there is room to explore, to be clear about the fact that things might not be crystal AND that’s okay. After months of saying “I think I might be…” one of my best friends got me a comic about polyamory for my birthday. Now I find myself talking about relationships and everything I’ve been judging myself for wanting while walking a tight rope between unclear and curious. This process is rubbing my tired eyes, waking me up to all the different ways to love. I can be sexual, but not romantic - or full of cuddles, then solicit a solitary sleep. While the unknown can be uncomfortable, the Three of Cups insists there are arms to fall into if we allow ourselves to be held through the ache of awakening. There is warmth to be had if we don’t shield our faces from the sun. There is love to be given if we are open to receiving. 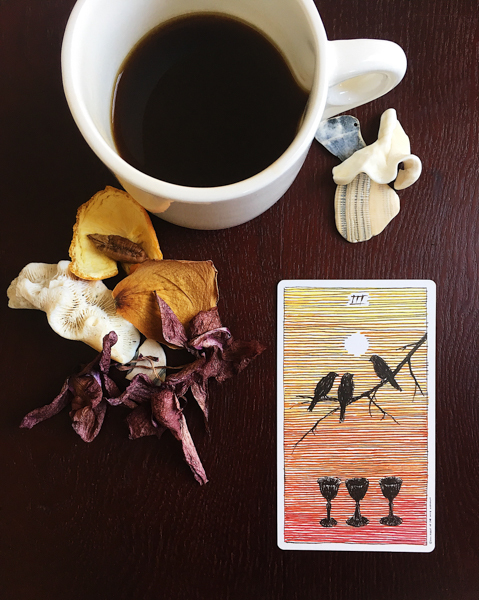 The Three of Cups is a pigeon with a message. Maybe not the most clever communication but to a keen eye it serves up the sublime in a silver envelope. It tells us that if we have an open door policy to vulnerability and discussion, we have a higher probability of receiving the love we want from whom we want it. There’s no right way to relationships. Mercury and Saturn are shifting your perspective, ripping you off the wrong foot so you can land on the right one. This week, decide to be undecided, dance to the offbeat path and let love twerk its magic in whatever suit strikes your fancy.